Papuan civilians around Timika have again been made wary of military provocations that may potentially revive a bloody horizontal conflict, after a former Freeport mine worker’s mutilated body was found in a roadside trench on January 19. Villagers from Kwamki Narama, just outside Timika, found the badly mutilated body of Hanok Rumansara, 40, from Biak, in a roadside ditch in front of the village. The autopsy on his body found Rumansara was riddled with over 23 stab wounds, plus a number of injuries cause by blunt objects, according to his human rights observers. A human rights worker with Komnas Ham, going by the pseudonym Kobewas Kores, posted information on social media that Rumansara had been picked up by a motorcycle taxi (ojek) rider to take him to Kwamki Narama. Whilst on the road, a group of unknown persons (orang tak kenal or OTK) set up a road block, and was not seen again until his body was found, according to witnesses interviewed by human rights workers. Indonesian police have claimed that though there is little information to work on, they are pursuing the culprits, according to citizen media website malanesia.com. Police have also claimed they have interviewed several witnesses and have secured arrows, bow, an axe and wood. However, Indonesian police have rarely showed a willingness to properly investigate OTK cases, which most credible observers in Papua laying the blame squarely on Indonesian special forces from either Kopassus or Densus 88. A former worker at the contentious Freeport-McMoRan run giant Grasberg gold and Copper mine, Rumansara had reportedly been active in the ongoing Freeport industrial dispute, according to initial information. It is unclear why Rumansara had lost his job at the mine, but he was amongst hundreds of workers who failed to regain their jobs after the record-breaking seven month strike ended in December 2011. Many Papuan ex-Freeport workers have been reportedly stranded from their home regions after not receiving any or enough severance pay from the management of the most lucrative gold mine on the planet. 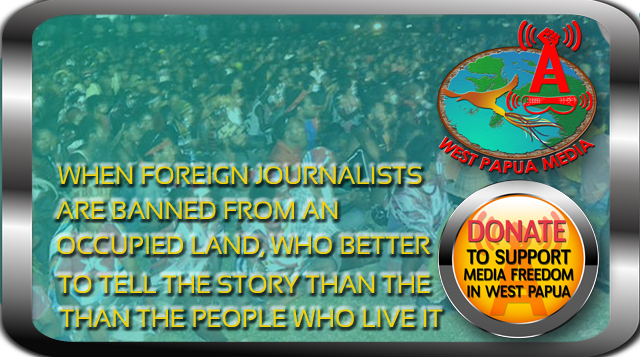 West Papua Media has no information at this stage to indicate that he was targeted in relation to his involvement at Freeport, or in the strike. If this were the case, it would represent a major escalation that would backfire significantly on the perpetrators, given the high political organisation of Freeport workers who are already tense given the recent gassing deaths of several workers. However, Local human rights observers have questioned if the latest OTK killing – the first since community-led peace building put an end to a bloody military-fostered inter-tribal war from 20 May to 5 October 2012 – was a deliberate act of provocation to upset the current fragile peace. The 2012 horizontal conflict claimed over 2o lives in numerous OTK killings, as well as direct tribal violence, while police and Indonesian military conducted operations deliberately designed to incite violence. 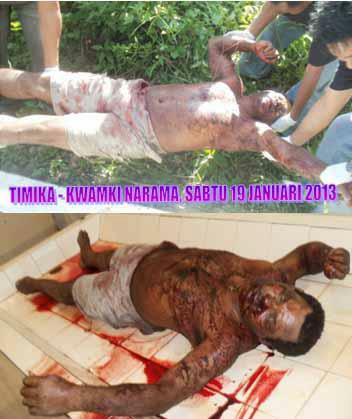 ‘Kobewas Kores’ believes that indeed there was an OTK killing, but they got their targeting wrong and killed a man from another part of Papua. “Is it possible that the killing was deliberately done to give birth to a conflict breaking out in Kwamki Narama village? I think the scenario actually missed the target of an indigenous person to Kwamki Narama. In this case there are specially trained parties, the Indonesian military is trying to sow confusion in Timika and Papua in general,” Kobewas said. Reblogged this on GO OKA WEMOHAWE.